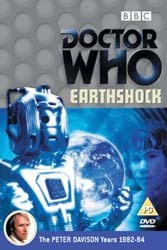 The return of the Cybermen was nothing short of the shock implied by the title. And fortunately, the story really did the metal menace justice. A dramatic plot, some excellent casting, first rate direction and some inspired design work all combined to create a classic Doctor Who. It really doesn't come much better than this. The new-look Cybermen were perfectly realised by Richard Gregory and even the usually wobbly sets appeared to have weight and size. These elements combined to add a much-missed realism to proceedings, an element that helped add power to an already powerful ending. To say that this is a great disc is so obvious that it hardly needs a mention. The usual mix of top quality extras combined with a pin sharp picture and crystal clear sound adds up to a really good package. Top disc moments include the Easter Egg - you really need to find it - and a special documentary that explains, with no holds barred, how the show was put together and why. If only all DVDs were as carefully put together as this one. But fortunately for fans of Doctor Who the BBC seems committed to a standard that others are rarely capable of following.